La Clusaz is a small town situated in the valley of the Aravis mountain range, near the romantic Annecy and an hour's drive from Geneva airport. You will feel a calm measured way of life and friendliness of locals from the first minutes of your stay at the resort. And such an amazing beauty of nature is not easy to find in all of France. La Clusaz is very popular among the inhabitants of France, and almost unknown beyond its borders. Despite its modest size, La Clusaz can proudly boast of a rich history, traditions and, of course, the achievements of its skiers. From these places fourteen winners of the World Cup and the Olympic Games in ski kinds and snowboards have come out. Olympic champion in 1992 in ski acrobatics Edgar Grospiron and silver prize-winner of the Olympics in Grenoble Guy Perillat polished their technique on these slopes. La Clusaz, together with the resorts of Le Grand Bournand, Manigo and Saint-Jean-de-Sixt, form the combined ski area of â€‹â€‹Aravis Massif and Lake Annecy, where a single ski pass operates. La Clusaz is a commune in the department of Haute-Savoie in the Rhone-Alpes region in southeastern France with a population of 1800 people. This famous ski resort is located in the Alps near the Swiss border. La Clusaz got its name in ancient times because of its location - the word Cluse - means "narrow path" between the two mountains. In 1902, the opening of the road connecting Annecy with the valley of Thones and the valley of Aravis allowed La Clusaz (before this small and remote village) to become a tourist center for summer and winter sports. In 1956 the first cable car was introduced. And already since 1969 La Clusaz is classified as a resort of winter sports and mountaineering. Annual Candide Invitational ski competitions are held here, in which leading athletes take part. The price you are quoted will be based on some factors, but don’t doubt – it will be the most profitable for that moment. Here at Alps2Alps, we do everything we possibly can for keeping our fares uniquely affordable during the whole ski season. Even if you will have your holiday and will travel to La Clusaz at the main peak of the season, even that time, we still guarantee you the lowest prices on all our services. All of the above will only result in our base-rate for ski transfers going down – we never over-inflate our prices. Unlike other transfer companies, we consider as many factors as possible to lower our standard rates whenever it can be done. We always recommend booking in advance, in order to get access to the very best deals and discounts. Alps2Alps usually offers substantial discounts for off-peak and midweek transfers to La Clusaz. Transfers during those periods will bring the biggest savings. For example, we give shares for transfers from Monday to Friday up to 60% than for the weekend transfers. Your transfer quote will also depend on such factors as vehicle availability, transfer schedule, vehicle utilisation and other costs like road tolls and airport parking charges. If you have any specific requirements, please get in touch directly so we can discuss your future ski transfer. 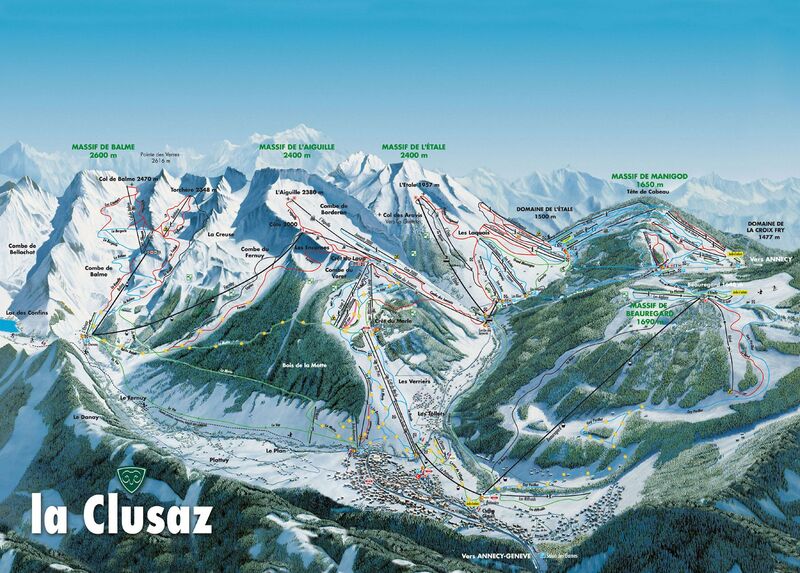 La Clusaz is good for skiers of all different level of skills, for advanced skiers as well as for the beginners. The resort culminates at 2600 meters. Today La Clusaz is a well-equipped resort with developed infrastructure, there are a lot of opportunities for family rest here. The resort is a part of the public network of family resorts in France "Famille Plus". There are excellent conditions for the little skiers to feel at home, and their parents could completely relax and not worry about their kids. Kindergarten will take care of all the babies in the absence of their parents. Alps2Alps is a team of professionals, we can ensure you of the premium quality transfer services, which we provide to all popular alpine ski resorts. As every professional we, certainly, know what’s expected of a ski resort transfer company. Did you guess? Sure, just a few requirements: arrive on time, in a comfort and friendly atmosphere, and paying the lowest price also. Well, we are ready to offer you all that things. As it was previously mentioned, it will be better for you to book your ski transfer ahead of time, in order to get the biggest value for money. If you’re already ready to get started, simply give us a call or fill out the online query form. Remember, the best trips always begin with the best transfers – exactly what Alps2Alps is all about!